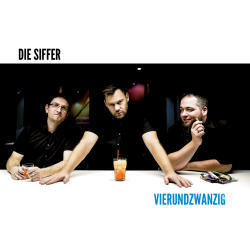 In the twenty-fourth year of their existence, Die Siffer release with Vierundzwanzig their eighth studio album. The band from Marbach, a town north of Stuttgart, has labelled its music from the beginning as hartchorpop, which isn’t so bad a definition. Their influences range from Die Ärzte, No Use For A Name, Bad Religion, Die Mimmis and even Die Kassierer, but also heavier bands like Iron Maiden and In Flames get credit. Vierundzwanzig is already the band’s fourteenth release, preceded by lots of longplayers, EPs and singles. And yet I was not familiar with this band before now. But this is about to change now. The opener Summer Of 60 Nein is a perfect start into the album, with finest pop punk in the tradition of Die Ärtze. The lyrics are also an important part of the music, with this track making fun of the countless rock classics that we have grown so tired of over the years. The following Alarm is a harder and faster track that reminds of the Boxhamsters, with the lyrics raising the alarm over the rising radical right problem. Alte Hüte comes with ska elements and criticises how trends are coming and going faster and faster. Jennifer Hart is a tribute to the TV shows of the Eighties and a downright singalong hit. Immervoll even adds swing elements. Vierundzwantig thus has started with a couple of incredibly great song, but the band can’t maintain that level throughout the album. There are some further highlights, like Gerade kennengelernt with parallels to Abstürzende Brieftauben, and Alles möglich which would not be suspicious on a Kettcar record, but there are also some weaker moments. Google mich is lyrically a good critique about losing your privacy in the age of the modern Internet, but the song itself feels overall too sterile. The funky Damals also doesn’t really work for me, and the concluding Vorbei feels a little dull, like Blumfeld on a dreary day. There is a lot of sunshine on Vierundzwanzig, but also a little shade. The band tries sometimes to hard to incorporate just too many genres into their music, and while it often works, it sometimes also goes wrong. Melodic punk – or hartchorpop – is where Die Siffer are at their most comfortable, and fortunately it makes out the biggest part of their music.